Habit at Kula Botanical Garden, Maui, Hawaii (USA). March 07, 2011. Origin and Habitat: Garden origin (nursery produced cultivar). The natural species comes from eastern Brazil. 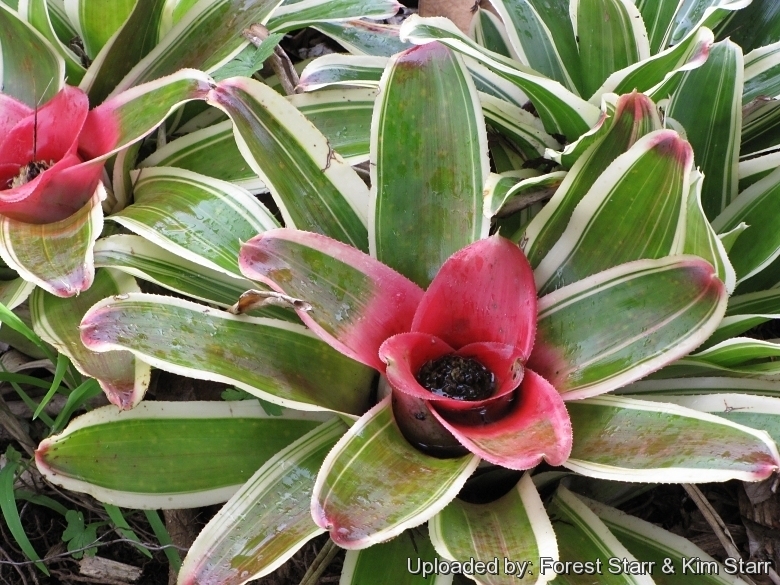 Habit: It is a small evergreen herbaceous epiphytic bromeliad that offsets readily to form a nice clump. The foliage of the rosette overlaps basally to forms a reservoir (phytotelma), in which rainfall and leaf litter can accumulate, allowing the plant to draw upon their water reservoir during periods of drought. Rosettes: Funnel-shaped, spreading, rather flat, broader than tall, about 20 cm tall and 35-60 cm across. Leaves: Narrow, ribbon-like, leathery, bent gracefully outward and then inward, up to 30 cm long and 2,5-3,5 cm wide, spine-tipped with somewhat densely toothed edges, hairless above, obscurely scaly beneath. Outer leaves are shiny glossy olive-green and stripped with creamy-white to pale yellow along the leaf edges while the leaves surrounding the central cavity before the blossoming, become of a red colour near the base, which persist for about one year. Sheaths large, sparsely covered with minute, dark brown scales. 11) Wikipedia contributors. "Neoregelia carolinae." Wikipedia, The Free Encyclopedia. Wikipedia, The Free Encyclopedia, 20 Mar. 2013. Web. 17 Sep. 2014. Cultivation and Propagation: Neoregelia carolinae "Flandria" is a slow growing bromelid of remarkable ornamental value for the particular shape and colour of the foliage. As it is native to rainforests, cool evening temperatures with warm days and high humidity describes its best growing conditions, however it grows very well as a home plant too, where it is able to furnish a long lasting note of colour even in the dark corners. Individual plants live three to five years and produces pups (smaller plants) readily after it has flowered.